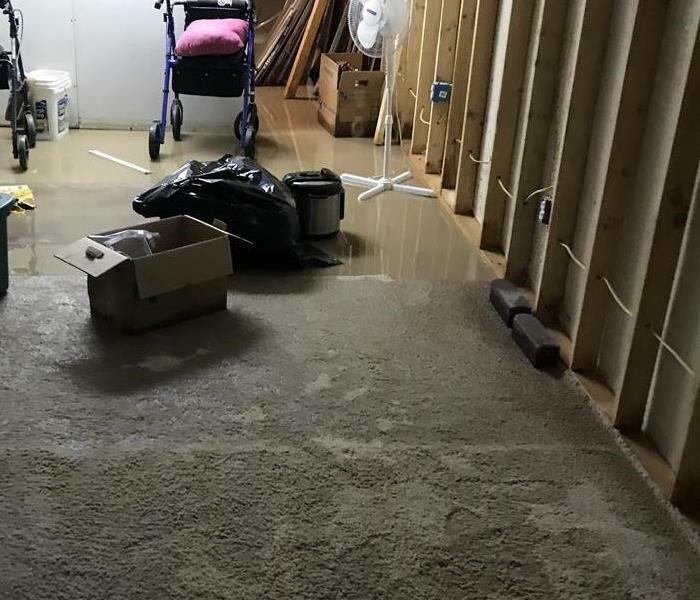 SERVPRO of Greeley/Windsor is hard at work to make this water damage "Like it never even happened." 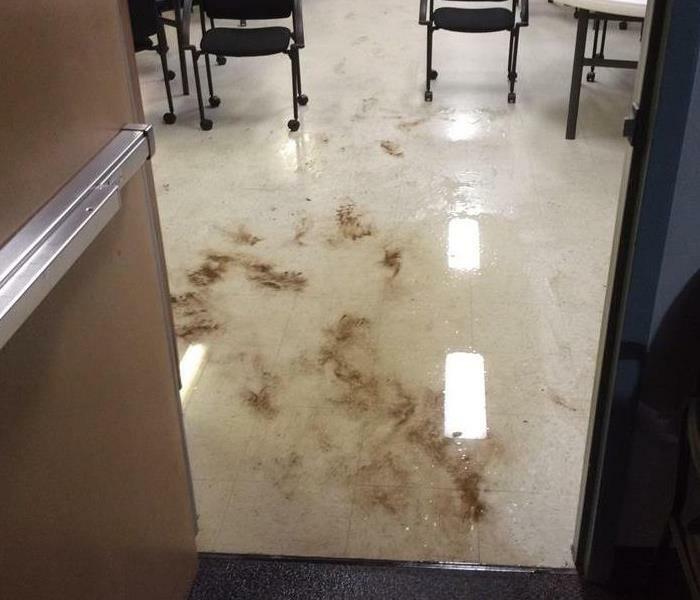 after a pipe break in a commercial facility in Greeley, CO. If you experience water damage, call SERVPRO of Greeley/Windsor. We pride ourselves in being, "faster to any size disaster." Our team was brought in to clean up this home after it was damaged by a sewage backup. We were able to get the home cleaned up and repaired quickly. No job is too small or too large for SERVPRO of Greeley/Windsor! We are to here to make it "Like it never even happened." Severe storms can happen anytime day or night unexpected. SERVPRO of Greeley/Windsor can respond and quickly begin clean up. Dumpsters can be dropped for the debris to be hauled away, then the mitigation and rebuild process begins towards pre-storm conditions. 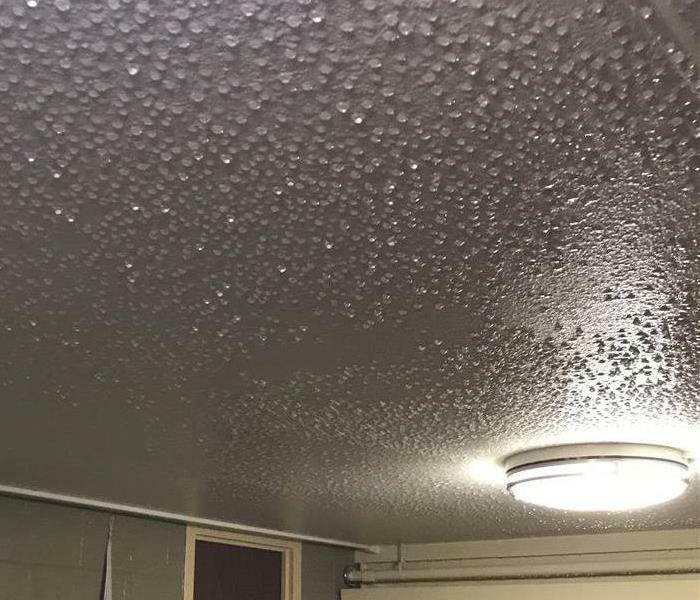 A local university had a major water loss due to a student on the 5th floor of a dormitory hanging a hammock by using the fire sprinkler for one end of the hammock. The result was 5 floors having water damage. We had 100+ air movers onsite to complete the job quickly as the students were in finals week, and the customer wanted to minimize the distraction for the students. The customer was pleased with our professionalism, expertise, and efficiency in completing the job quickly. Another satisfied SERVPRO of Greeley/Windsor customer. This home in Greeley, CO was damaged when several storms saturated the ground and ground water started entering through the foundation of this home. We immediately started extraction upon arrival, but found a spot where the water was coming in faster than we could extract. The homeowner was able to get someone onsite to repair the hole. Once the repair was complete extensive drying and cleaning had to be done to the home back "Like it never even happened." This business in Windsor, CO was damaged when a pipe in the ceiling broke during the middle of the night. 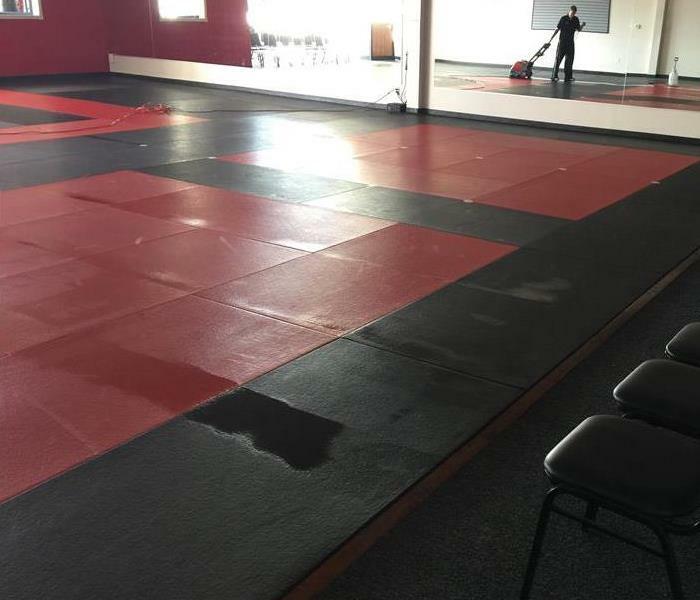 Having classes pre-scheduled, the owner wanted the area dried as quickly as possible. 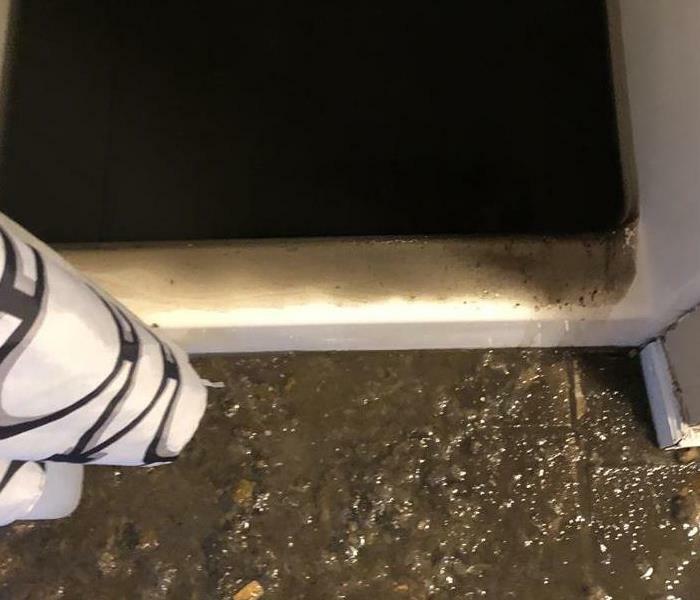 Once onsite our technicians extracted the water out of the mats and extensive drying and cleaning had to be done to get the business back into operation as quickly as possible. The business down time was minimal and the owner was very pleased. This basement in Windsor, CO had several inches of standing water before we arrived on scene. Our technicians were onsite within 1 hour of receiving the call. Upon arrival our technicians explained the mitigation process to the customer, and received approval to begin the work. The customer was pleased with our professionalism, expertise, and efficiency in completing the job quickly. 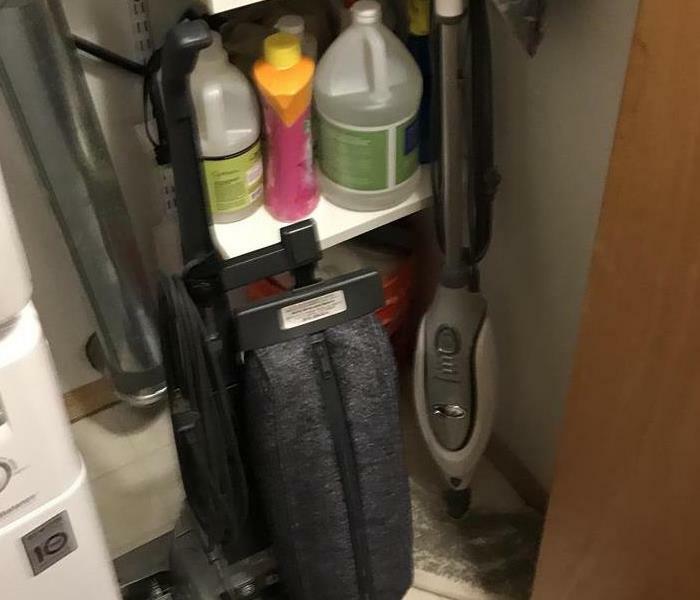 This toilet backup in Greeley, CO left sewer water standing throughout the bathroom of this rental property. 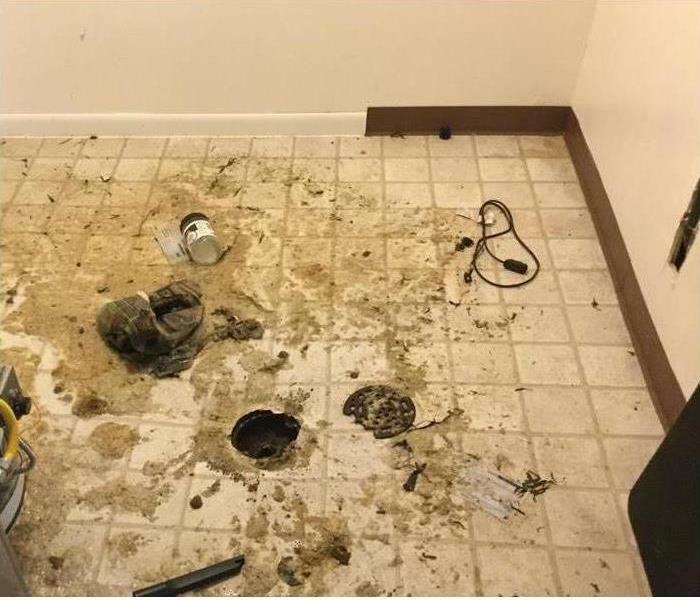 The renters moved out and the property management company did not check the property until several days later. 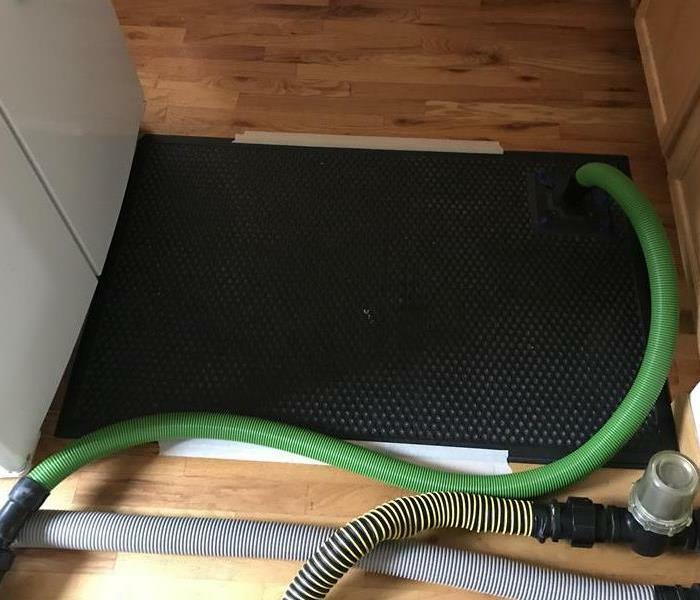 SERVPRO of Greeley/Windsor was able to get on the job and start the mitigation process and cleaning up the mess within a hour of receiving the loss information. At our safety meeting our local fire department conducted a Fire Extinguisher training for our staff. We all participated in a simulation of a fire and used special fire extinguishers to put out the fire. Everyone took their turn, and enjoyed learning the how and purpose of a fire extinguisher. Did you know.... the main purpose of a fire extinguisher is to put a blanket with the powder in a fire extinguisher on the vapors between the source and flames to create a path that you can escape. Very valuable training to our entire staff! 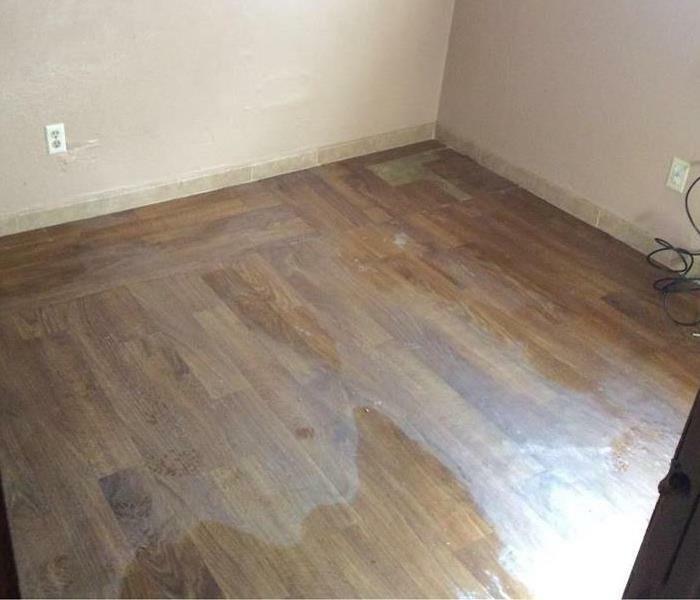 An important key to successfully saving a hardwood floor when you have water damage is to quickly get the water removed and drying equipment set up. SERVPRO of Greeley/Windsor was onsite within one hour of notification of this water loss and we were able to save the hardwood floor. Time is important during a water loss, it can mean the difference of saving or replacing the affected flooring. This customer was very pleased due to SERVPRO of Greeley/Windsor’s quick response time that their hardwood floors were saved. Many times we are called out requesting a mold check. When there is no visible mold, we refer our customers to an Industrial Hygienist for complete piece of mind. This customer did contact a Hygienist and had testing done. The test revealed that they had elevated mold spore counts in their laundry room. SERVPRO of Greeley/Windsor went onsite removed the flooring, sanded the subfloor and applied an antimicrobial. The customer was very thankful of our recommendation to contact the Industrial Hygienist and the professionalism of all the SERVPRO of Greeley/Windsor employees that she had contact with. 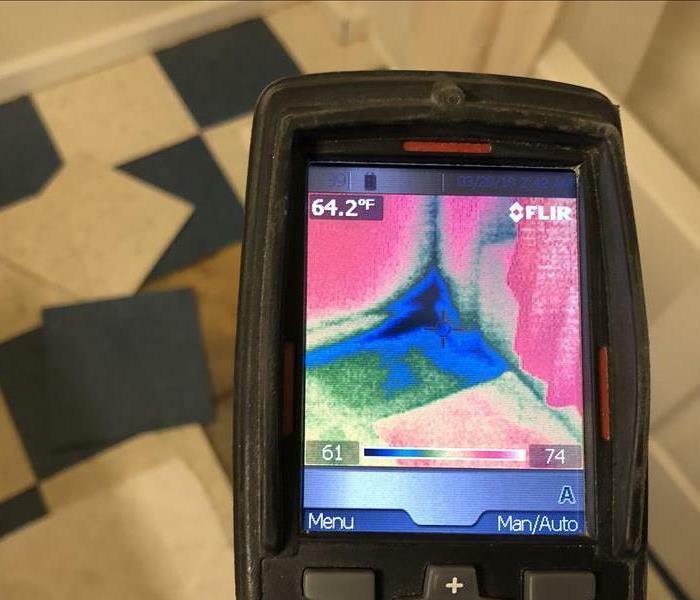 This is a commercial job we are doing for a local apartment building here in Greeley, CO. Having prime access to the building entrances and the luxury for our technicians to have a FLIR camera with them at all times enables us to identify the water damage areas and get the job done quickly. Water requires quick extraction and we couldn't do it without the proper equipment and access. 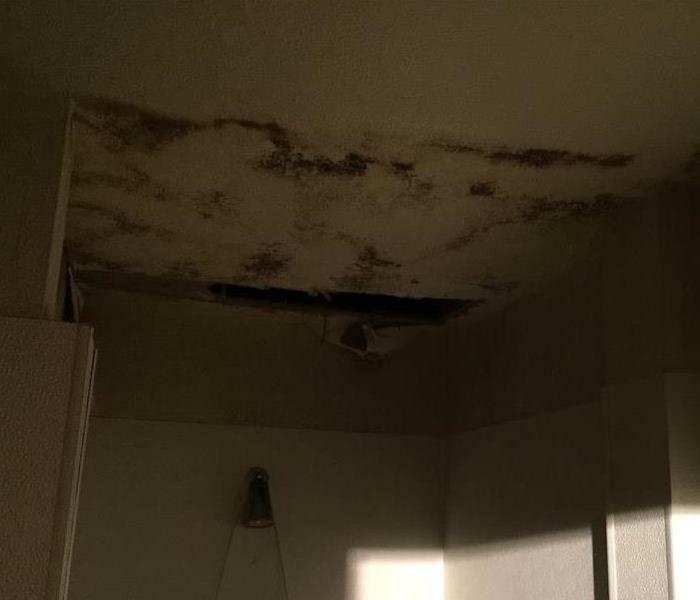 This mold occurred due to a slow leaking pipe in the ceiling above the shower. 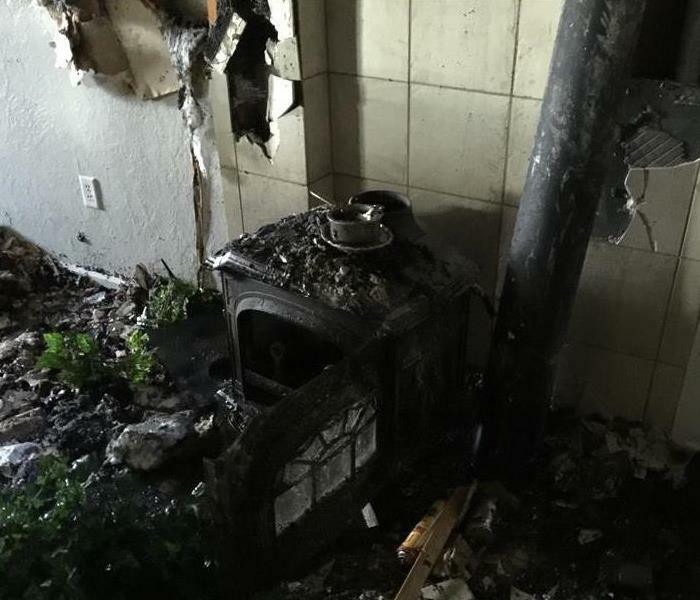 The owner was disable and never went into the basement, so the loss had been going on for some time. 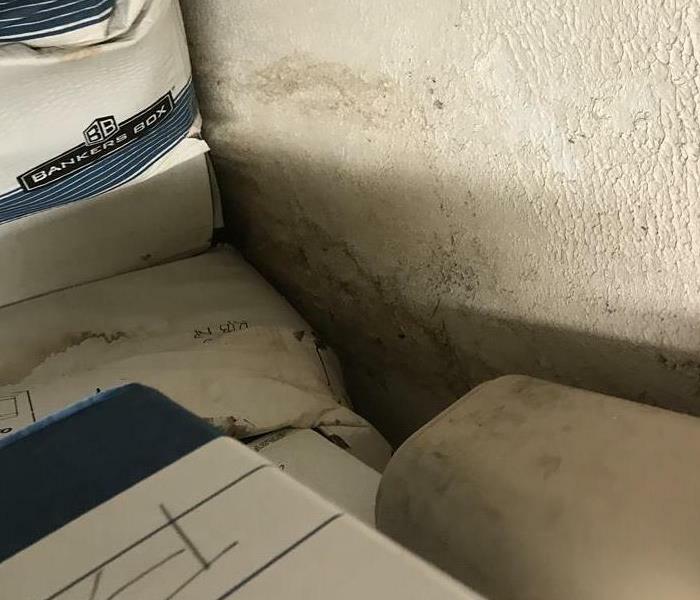 When our certified technicians arrived onsite, they quickly assessed the damage and communicated the plan for the mold remediation; however, the pipe had to be fixed prior to us completing the mold remediation. 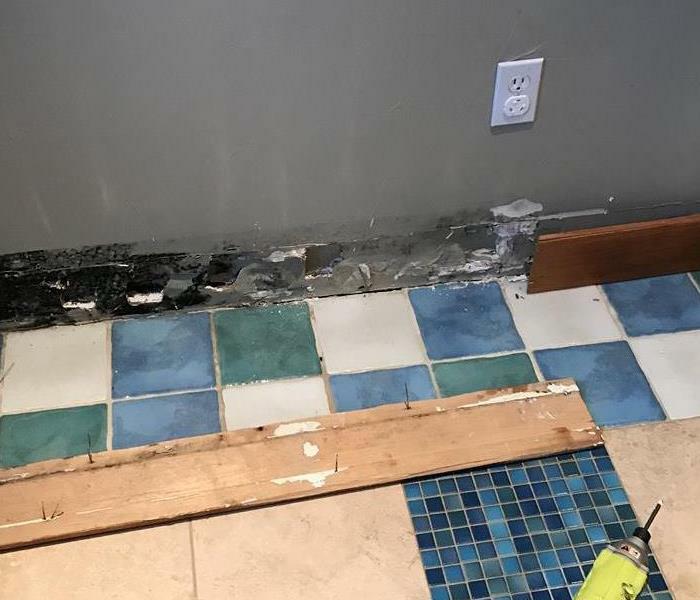 The property owner did not know of a plumber so our technicians called a local plumbing company we work with, and they were onsite with the hour and fixed the pipe so we could begin the remediation. The property owner was very pleased with our willingness to assist him in getting the pipe fixed and begin our work. 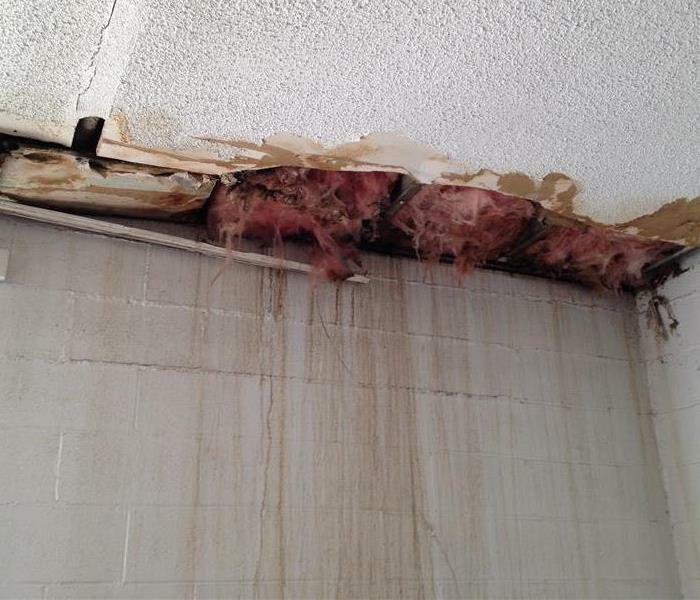 SERVPRO of Greeley/Windsor completed a full mold remediation to make this loss, "Like it never even happened." Another, very satisfied customer!! Our technicians cleaned all the smoke damaged areas as well as some water damaged areas due to putting out the fire. 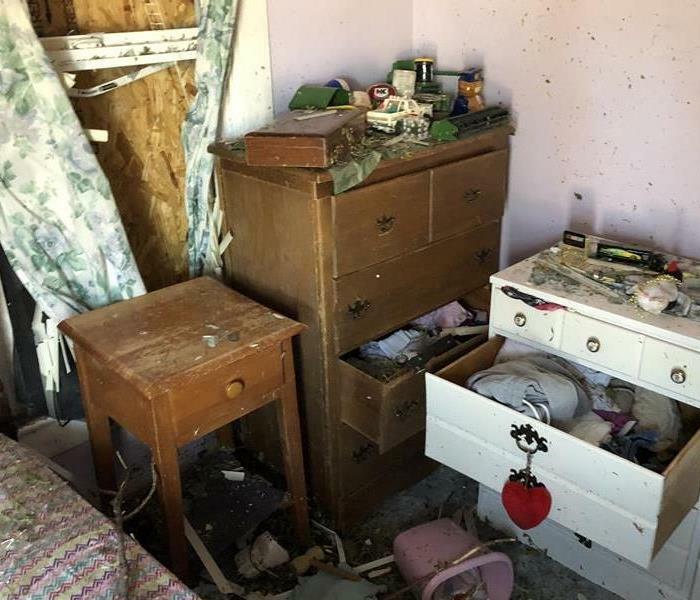 The owner could not believe how quickly and professionally the SERVPRO of Greeley/Windsor team responded and began the cleanup process. The most often leaks that go undiscovered until it’s a huge problem is refrigerator lines. Let’s face it most of us don’t pull out the refrigerator on a regular basis, so if the water line to the refrigerator has a leak, it’s not usually discovered until the damage is extending out past the refrigerator. By this time, mold can begin to grow, and now the problem is not only a water damage issue a much larger issue, mold. SERVPRO of Greeley/Windsor has a team of highly trained technicians who are experienced to handle your mitigation process making it “Like it never even happened." Call SERVPRO of Greeley/Windsor 970-353-1388. Humidity was the suspected cause of the mold on the joists of this crawlspace in Fort Collins, Colorado. Mold can cause health issues for some people as well as being annoying and smelly. This property owner become very ill before finding the true cause of her health issues, she was allergic to mold. If you suspect you have a mold problem, call an Industrial Hygienist and get Mold Spore Air Sampling done in your home. That is the only genuine way to know if you have a mold issue. This commercial building was damaged when the roof developed a roof leak due to the fact that the roof was flat and snow sat all winter on the roof. When the sun melted the snow it had nowhere for the water to go, year after year. The integrity of the roof became compromised in several spots and eventually the ceiling came down in several different spots. Extensive drying and cleaning had to be done to get the building back to "Like it never even happened." This home in Greeley sustained substantial water damage due to a downpour of 4” of rain water. SERVPRO of Greeley/Windsor responded within 45 minutes and had the water cleaned up within a couple hours. The customer was devastated when we arrived, but within that couple of hours, we could see the stress melting away as the homeowner witnessed our crews going to work to save all their personal belonging and residence. The customer was very happy, with our response time and professionalism of our technicians! 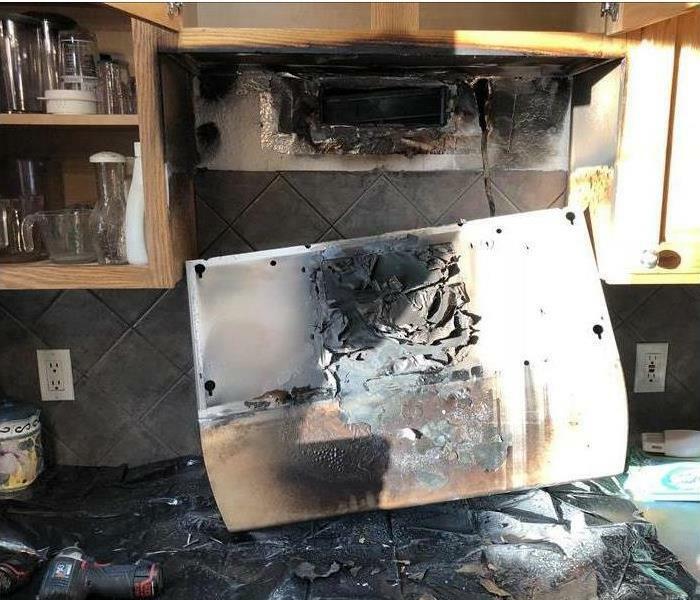 This demonstrates that SERVPRO of Greeley/Windsor goes above and beyond to help make it "Like it never even happened." 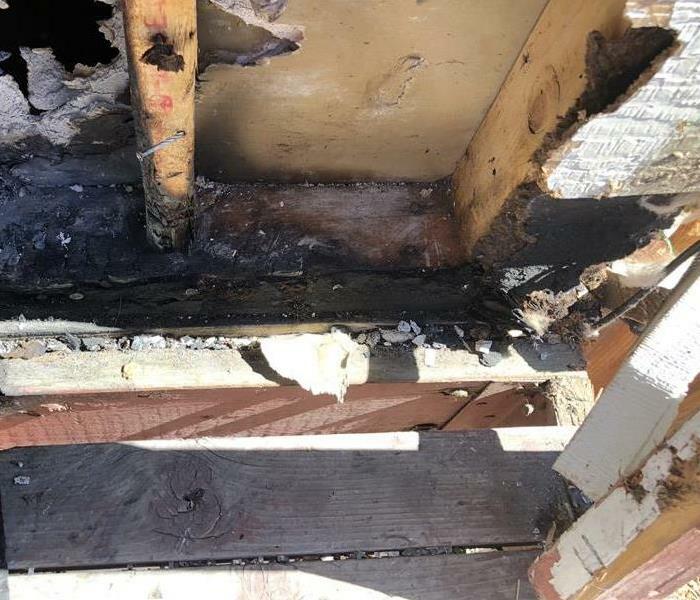 While onsite at a local water loss, our technicians were pulling baseboard in a local residential pool house and discovered mold. It is speculated that mold growth was due to the high humidity due to the indoors swimming pool. 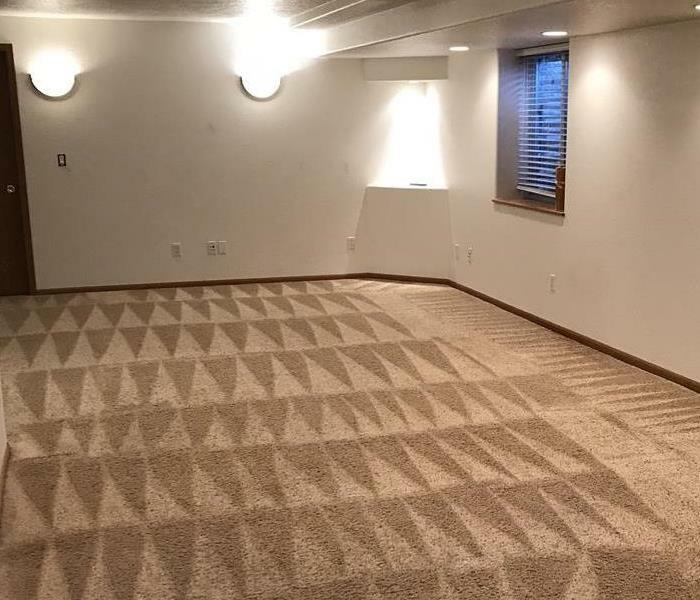 SERVPRO of Greeley/Windsor was able to clean and sand the affected area and spray an antimicrobial in order to prevent future growth. 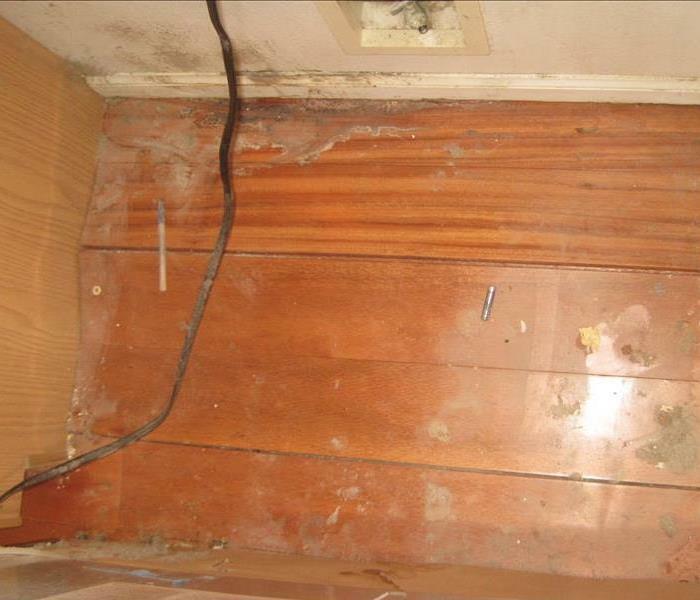 The homeowner was very thankful for the thorough examination of his property to uncover the mold before it got severe. 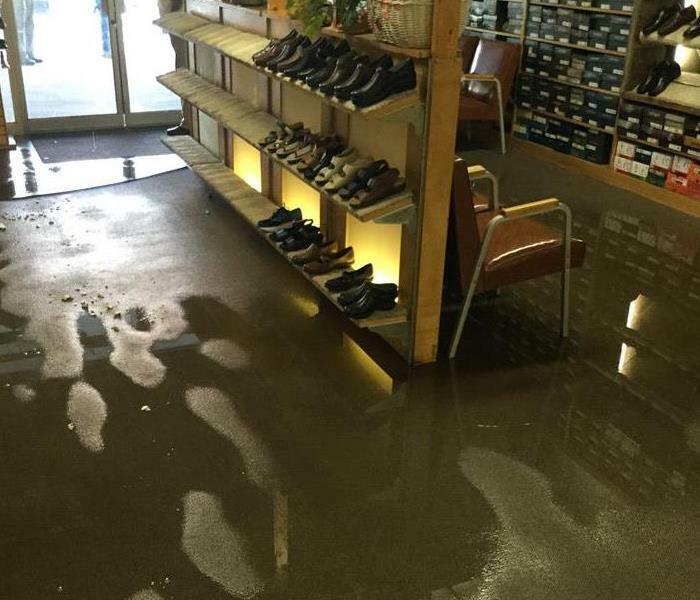 When a pipe burst in this footwear store in historic downtown Greeley the owner called us at 7:00 in the morning in a panic. The owner was very pleased as SERVPRO of Greeley/Windsor was onsite with 30 minutes. We extracted the water, set up drying equipment and the entire job was completed in 3 days. Another SERVPRO of Greeley/Windsor satisfied customer! 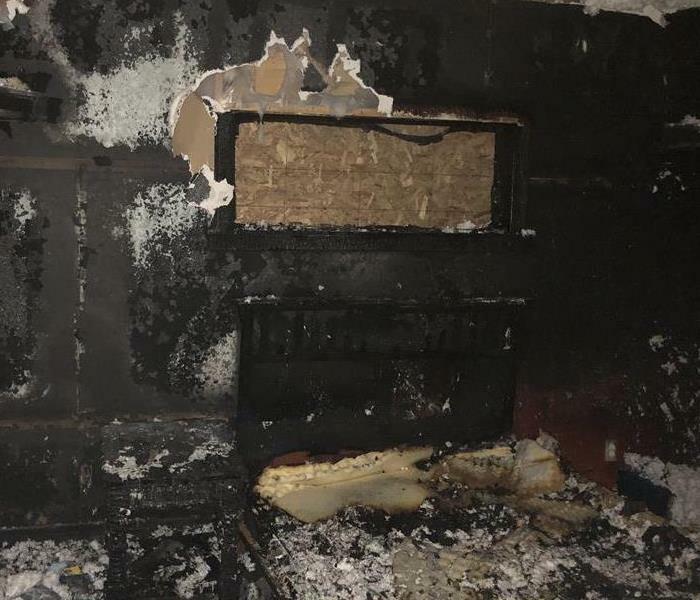 A local customer had their range hood catch fire and extinguished it very quickly with a fire extinguisher; however, the smoke damage was extensive throughout their house. The belief that fire damage is just cleaning up the charred area is incorrect. The majority of the cleanup is smoke damage. SERVPRO of Greeley/Windsor professionals are highly trained in property restoration and equipped with the knowledge on restoring your property. If you experience a sewer backup do not let a carpet cleaner simply clean your carpets. 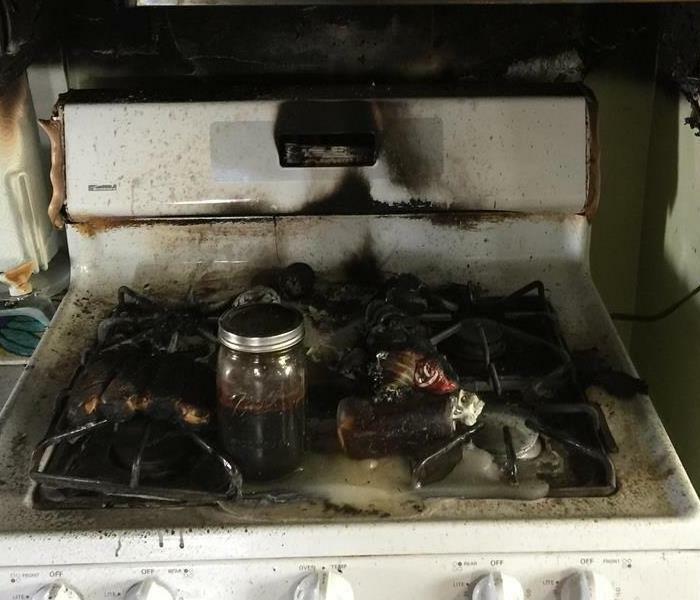 This would be a Category 3 loss, and that means the water is grossly contaminated and may contain harmful agents. If this water gets into the carpet and pad it should be removed. No amount of cleaning can guarantee all harmful agents are removed. Call SERVPRO of Greeley/Windsor for complete peace of mind that your loss is handled professionally by certified trained professionals. 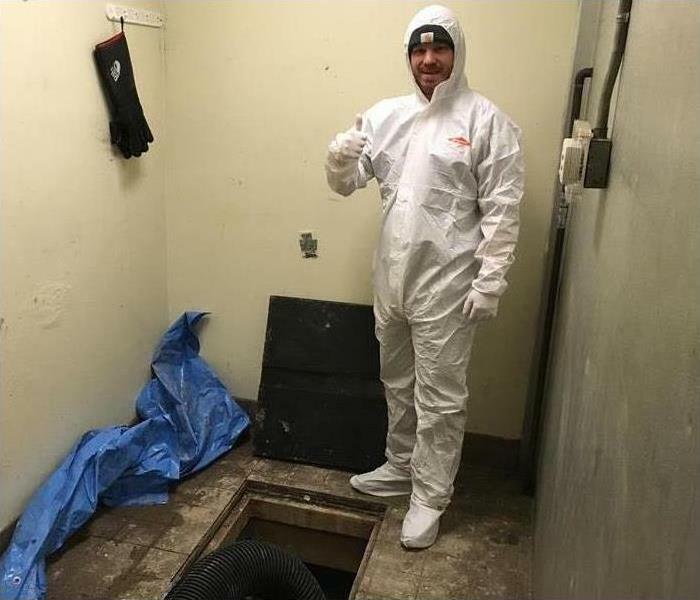 A local country club had an odor problem coming from their crawlspace. Once SERVPRO of Greeley/Windsor went onsite, a broken sewer pipe was discovered. The guys were all suited up in Tyvek suits to begin with, but added full respirators to their PPE due to the size of the loss, and the confined space that they had to work in. SERVPRO of Greeley/Windsor always take the safety our employees very serious, so a portion of our weekly staff meetings will cover employee safety. This home was saturated with water from a broken pipe. 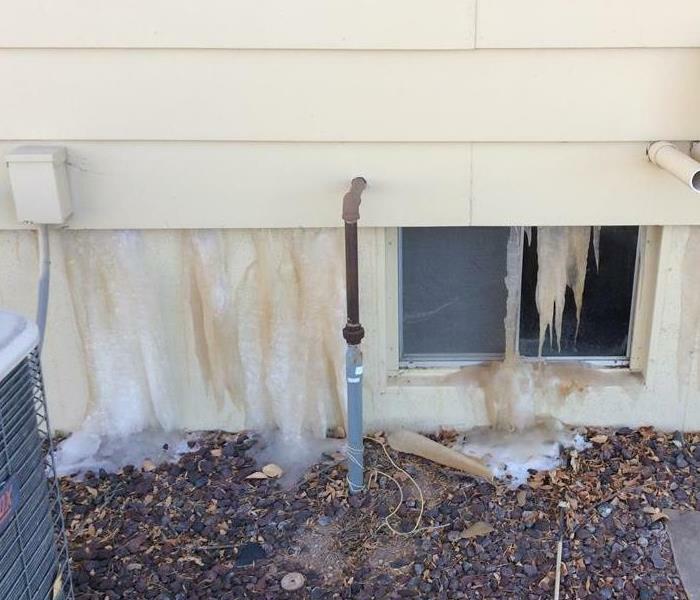 The customer was out of the country and after a big snow storm with a deep freeze, neighbors noticed water coming out of the garage. It is important to have the water mitigated, and the affected areas properly dried as quickly as possible, or mold will form. 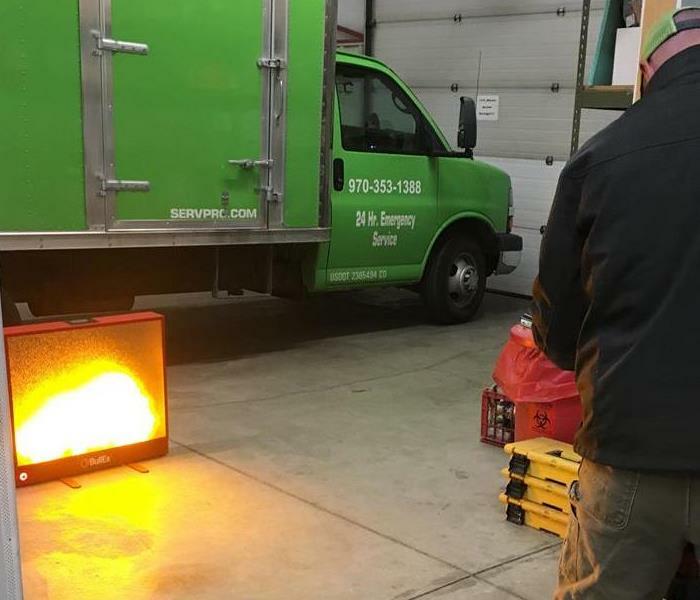 SERVPRO of Greeley/Windsor is available 24 hours a day, 7 days a week, 365 days a year to respond to your property damage, no matter how large or small! 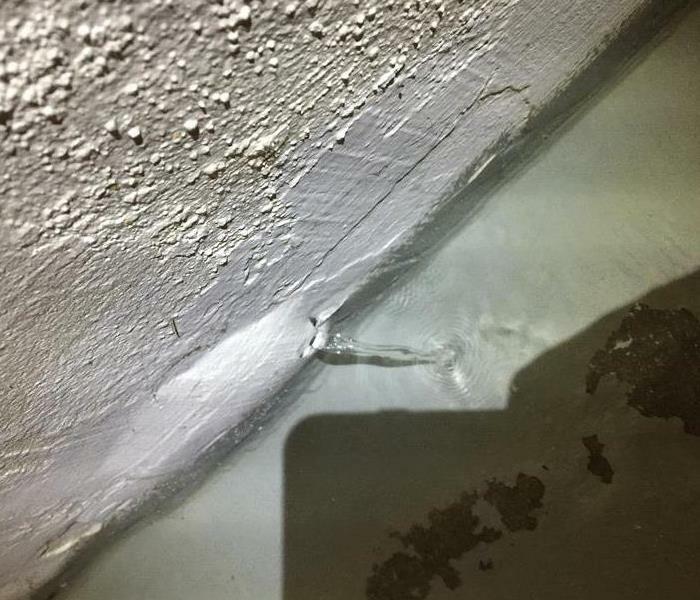 This photo exhibits in-place Injecta-Drying after a water damage. Small holes are drilled into the mats, which cover the wet areas and tubes connect to a special drying system. Moisture is either extracted from the floor or air is pumped through the hose to expedite drying without removing the floor. SERVPRO of Greeley/Windsor made another customer happy. "Like it never even happened." A newly installed washing machine with improperly installed hoses flooded this basement in Greeley. 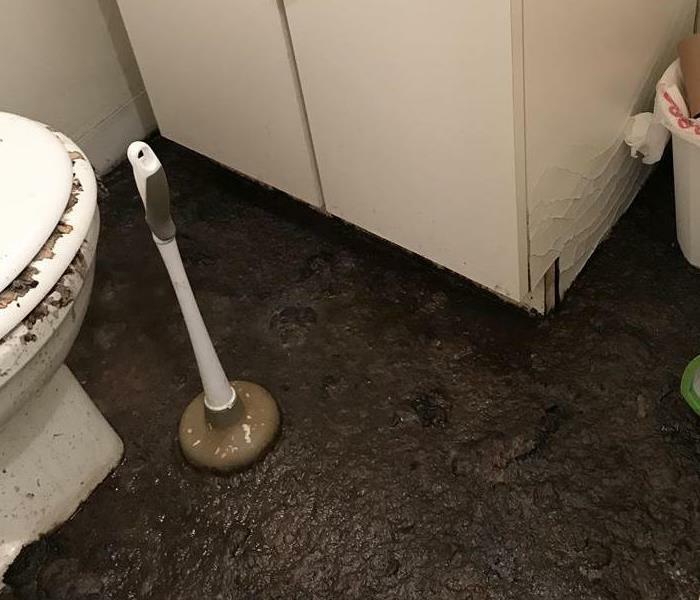 The customer had recently moved to a new house and was getting this house ready to rent when he arrived one day to find the basement carpeted floors totally soaked. 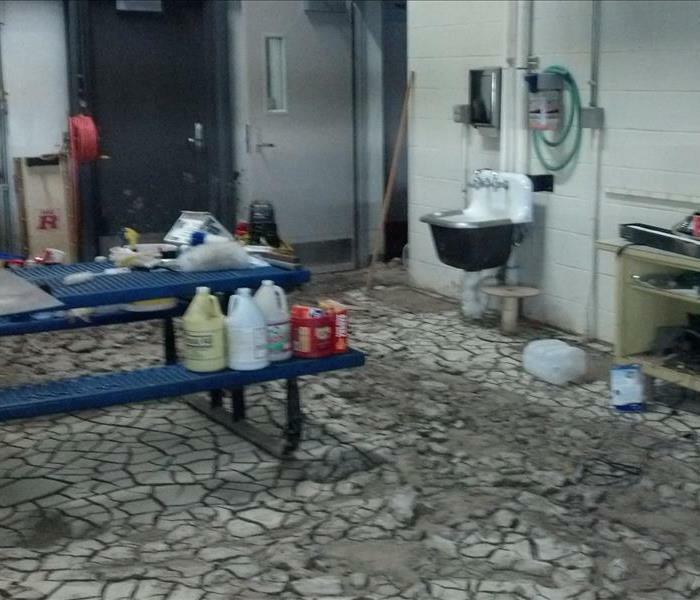 SERVPRO of Greeley/Windsor was onsite quickly to inspect the damage and to begin the water extraction process. We were able to save all the carpets. If water damage is not handled properly and quickly, it can cause severe damage to the structure of your home or property. The longer you wait, the worse the problem will get. 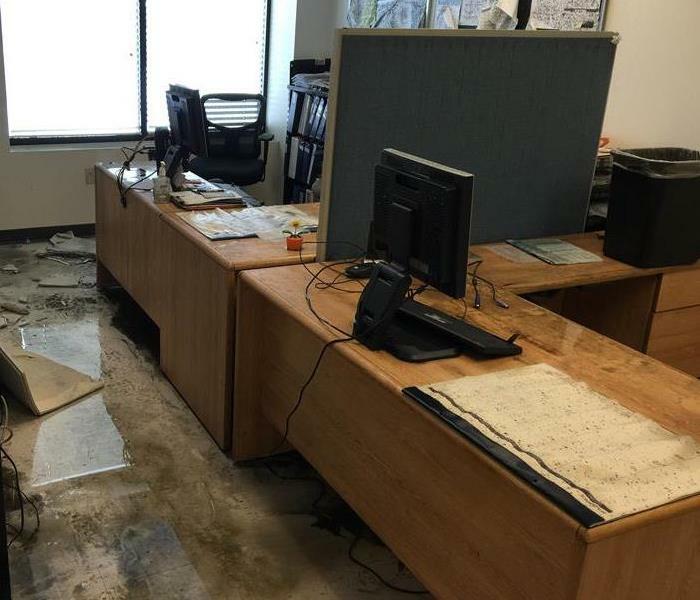 Call us at 970-353-1388 for your water damage emergency. 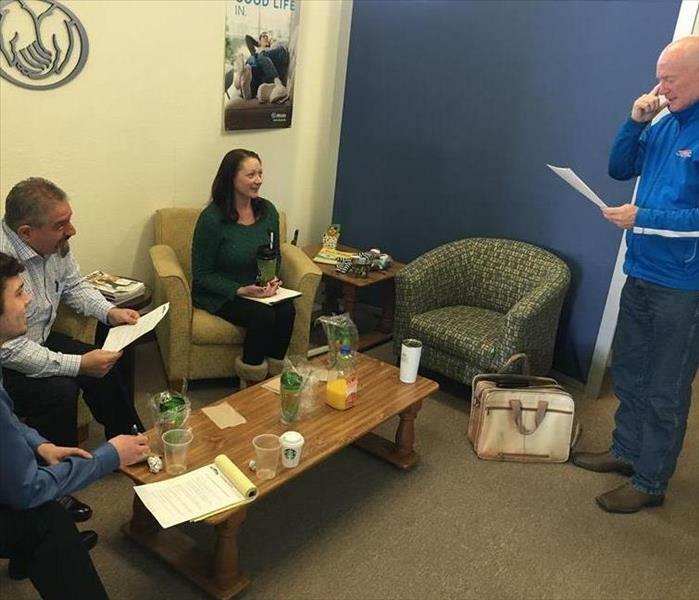 Our Marketing Representative, Tom Shaw, had a great Lunch-N-Learn with a local Allstate Agent. It's always a pleasure when we have the opportunity to go into an agent's office and educate the agent and their staff on the services SERVPRO provides!! SERVPRO of Greeley/Windsor had a great time marketing at the Greeley Chamber B2B (Business to Business) on Thursday, November 16th. 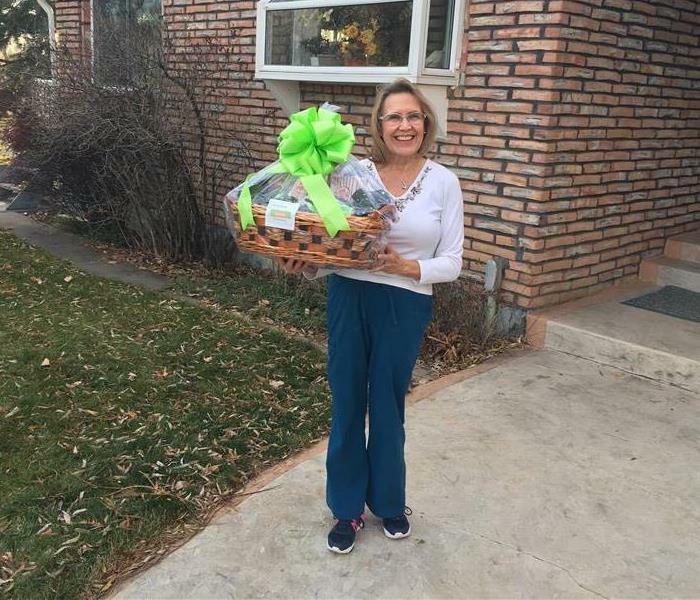 Our congratulations to Butch & Sandee Strobel at 1st Avenue Storage for winning the SERVPRO of Greeley/Windsor gift basket! We hope they enjoy! 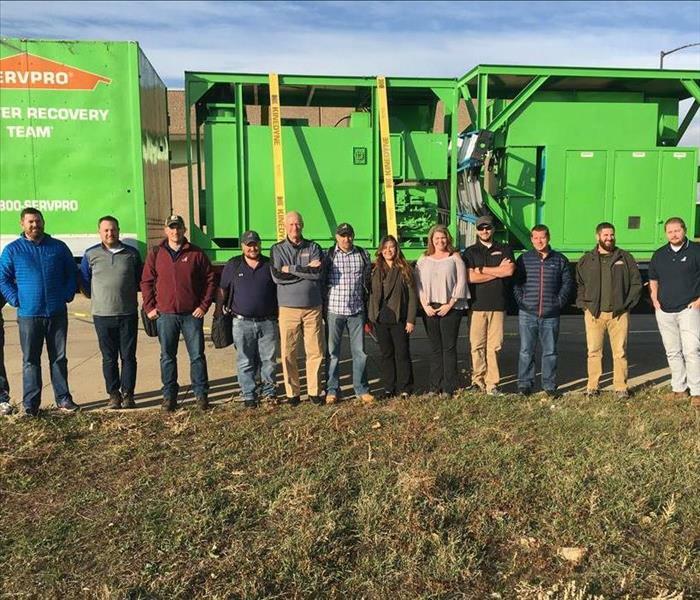 On Thursday, November 2, 2017 SERVPRO of Greeley/Windsor and SERVPRO of Greater Boulder hosted a "Day of Learning" on fire and water mitigation for The Hartford Colorado Claims Team and managers. FRSTeam, Rescue Tech, Quality Environment, and Colorado Art Restoration. It was a great day of learning! 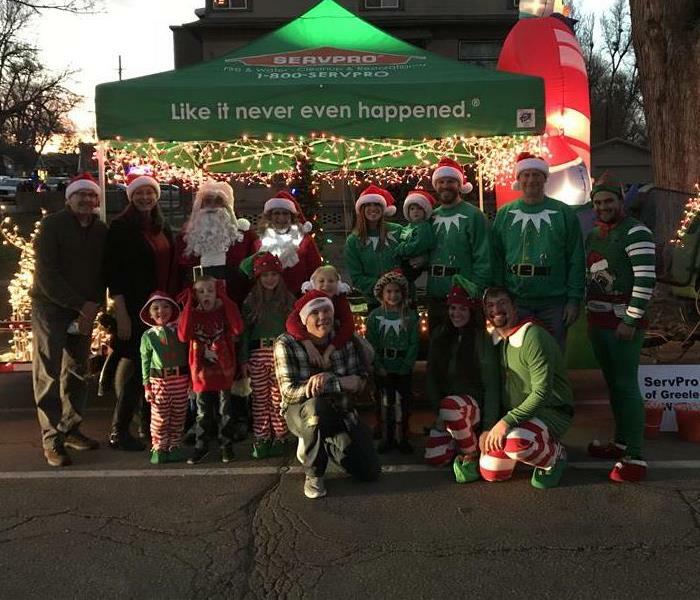 SERVPRO Greeley/Windsor were proud sponsors of the Greeley Chamber "Greeley Lights the Night" parade held on Saturday, November 25th. We had little SERVPRO "elves" riding on our float, while SERVPRO employees and families were handing out candy along the parade route. Mr. and Mrs. Santa were even represented by one of our employees and her husband! It was estimated that there were over 6500 people in attendance and we had beautiful weather for a parade! There was only one thing missing, SNOW!! There are a lot of marketing vehicles, with all kinds of wraps, paint jobs, etc. We wanted to stand out, but yet we wanted to do it with class and appeal! We love our new marketing vehicle,it's "custom" design and we feel SERVPRO of Greeley/Windsor will stand out with appeal and visibility! Thank you to Ashley Fusco, at Raven Signs in Greeley, for designing a great half wrap for us! 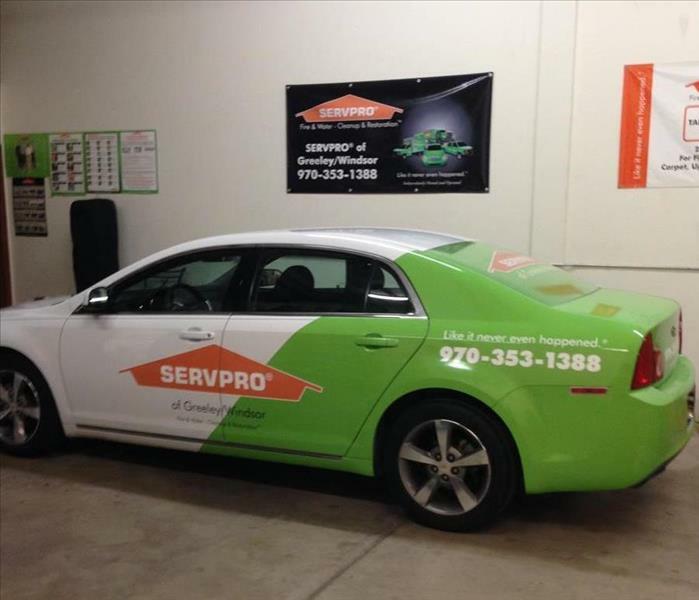 Now, when we driving the streets marketing, people will take notice of SERVPRO of Greeley/Windsor because of our unique car wrap and it's appeal! Drying a structure during an emergency takes more than just having equipment. You need the right equipment set and monitored by a certified technician. 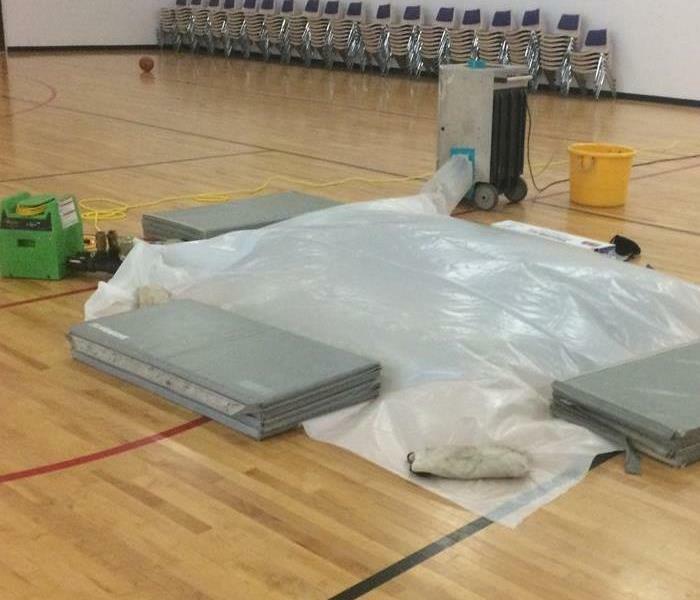 During the recent rain and hail event of May 8, 2017, we had the opportunity to help save the gymnasium floor at Trinity Lutheran School in Greeley, CO. Creating a drying tent, using drying mats, allowed for directed concentrated drying. Using our Air Wolf (not the 80's TC show!) drying equipment we were able to move air under the wood flooring with minimal intrusion. See the photo, and remember, SERVPRO of Greeley/Windsor for all your mitigation needs. This room was flooded but we removed the mud and water. We repaired the water damage and cleaned up keeping the formation of mold. 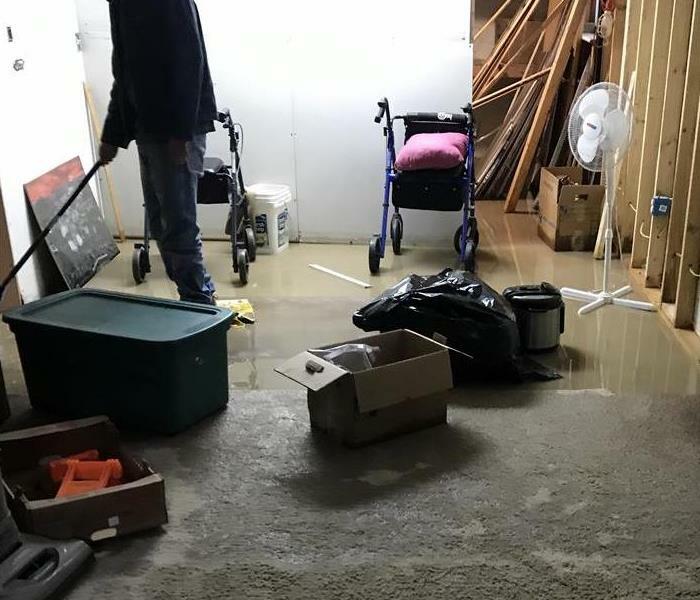 When your home is being threatened by water damage from flooding or leaks, SERVPRO of Greeley/Windsor Professionals have the expertise to prevent or mitigate the devastating effects water damage can have in order to help preserve and restore your property. SERVPRO of Greeley/Windsor Professionals have the equipment and experience necessary to handle the most challenging water damage and removal situations and are available around-the-clock. 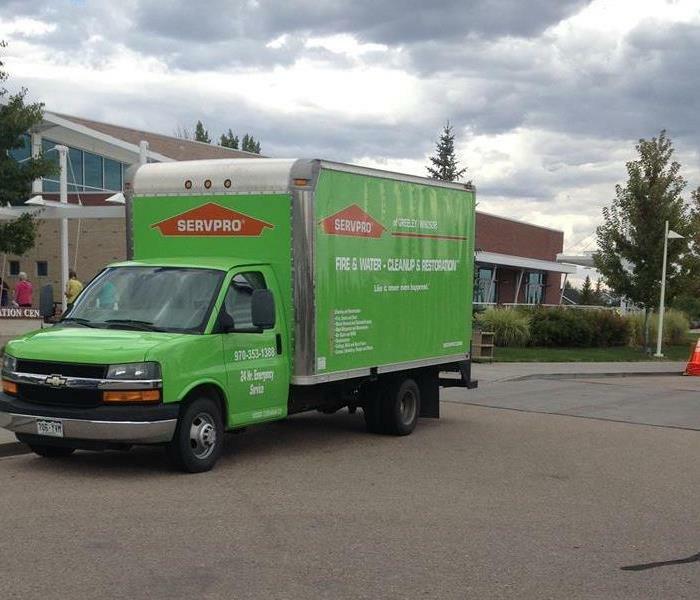 SERVPRO of Greeley/Windsor Professionals concentrate on safely drying, deodorizing and disinfecting the areas flooded or damaged by water. 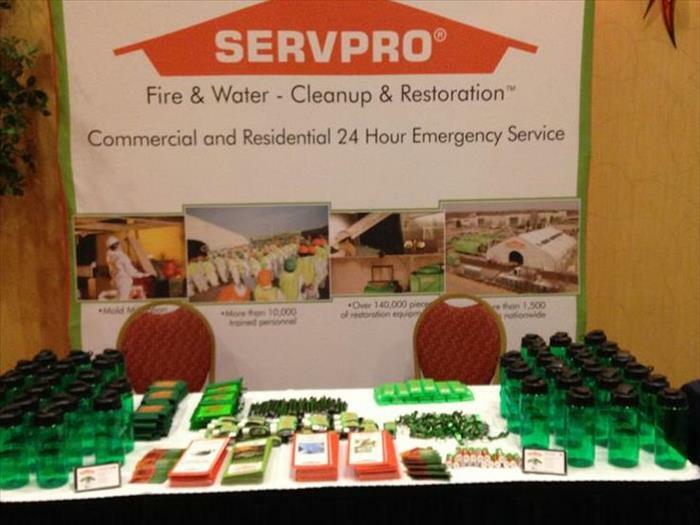 SERVPRO of Greeley/Windsor was a vendor at Flood & Peterson's Risk Symposium and was able to connect with several individuals and companies that are important COI's. Barb and Andy enjoyed their day promoting SERVPRO and the exceptional customer service that SERVPRO of Greeley/Windsor provides. 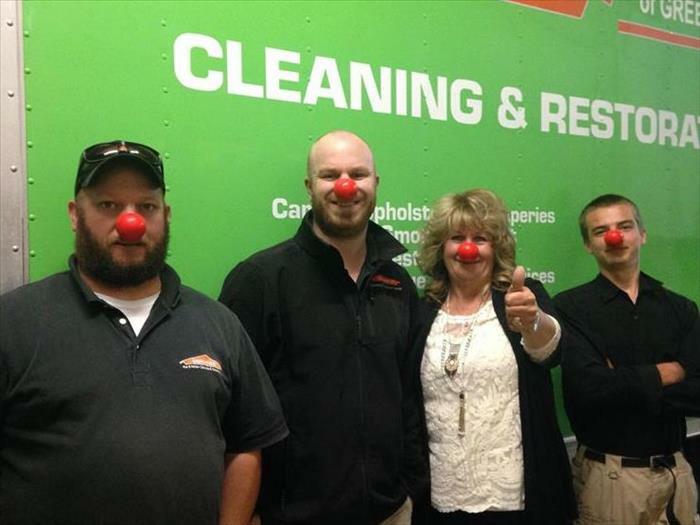 SERVPRO of Greeley/Windsor participated in Red Nose Day 2016 by wearing their "Red Noses." Red Nose Day is a campaign dedicated to raising money for children and young people living in proverty by simply having fun and making people laugh.